Two bridges spanning over the canal on South Sea Pines Dr. connecting the existing leisure trail to Beach Walk 25 (located between Snowy Egret and Black Skimmer- pictured here) and Beach Walk 26 (located between Surf Scoter and Snowy Egret-not pictured). Stainless steel cables will be installed along these new bridges and asphalt work is scheduled. Stamping of two crosswalks between the new pedestrian bridges and the existing Beach walks 25 and 26, to improve visibility of bike and pedestrian crossings is scheduled. 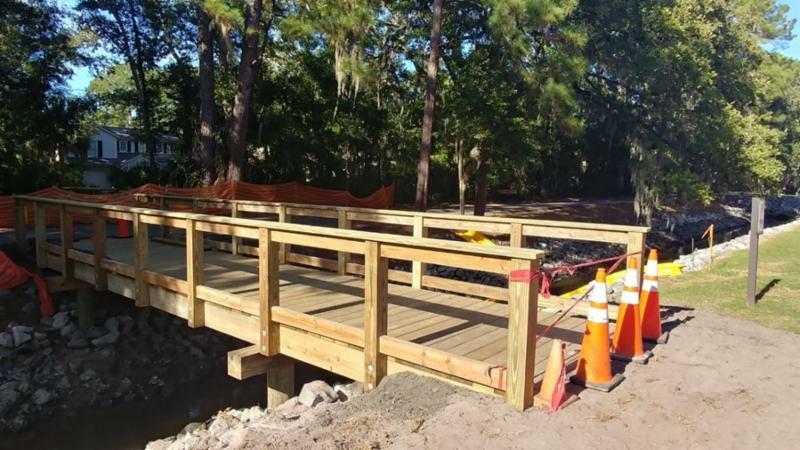 Sea Pines CSA Maintenance will begin phase two of the Sea Pines Timber Bridges project the week of November 5th with working hours for CSA Contractors between 7:00AM and 6:00PM. In Phase two we will reconstruct the current pedestrian bridge that is located on Greenwood Drive near the Sea Pines Drive intersection. During Phase two, CSA will have a small detour for bike and pedestrian traffic as the existing bridge is being reconstructed. Phase two will be completed in approximately 2 to 3 weeks, weather permitting. Below is a map of the small detour for leisure trail traffic. 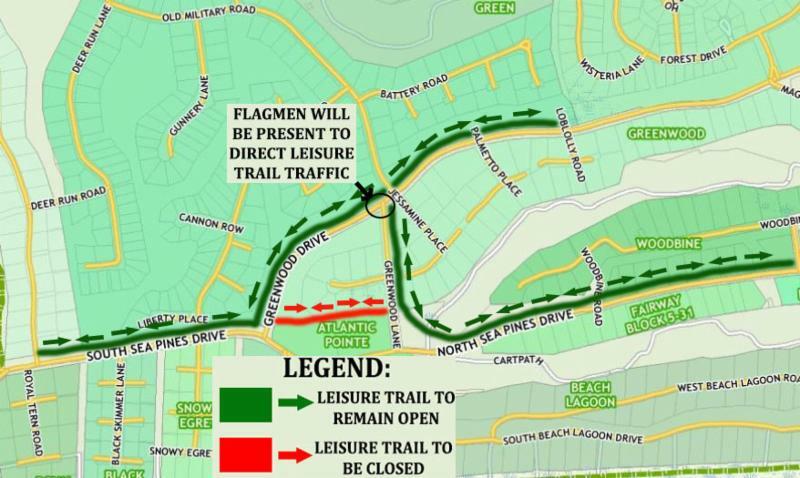 Flagmen will be present to direct leisure trail traffic. If you have any questions regarding this project, please contact CSA Maintenance at 843.671.7849 or email: csamaintenance@csaseapines.com.